I went to a brunch this weekend with a friend. I’m not sure how we got around to this topic (perhaps a conversation about it being Chinese New Year) but we started reminicsing about the surprise party that my staff and my customers had put on for me when I closed my antiques/home decor store four years ago. It was about a week before the doors closed for good and basically the space was empty – everything had been sold. Unbeknownst to me the group had moved in furniture, set up a bar, had guests bring potluck items for a delicious buffet – the whole works – even candles. I was awestruck. One of the nicest mementos of the evening was a big bag of fortune cookies. One of my customers owns a large company that provides condiments in little take out packages – like soya sauce, ketchup and so on. 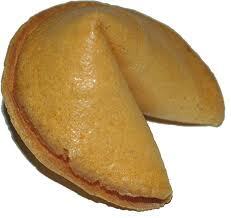 They also make fortune cookies. He created a special message for the evening and every guest got to take some fortune cookies home. About two months later I received a call from a stranger who wanted to know if the number she was calling was a real telephone number. It turns out she found my number on a little slip of paper inside her fortune cookie at the end of her meal at a Chinese restaurant. She was calling from Calgary, which is about 200 miles away from our city. Apparently my special fortune cookies had travelled. Happy Chinese New Year!